This 7 day Uganda Super Safari takes you to Bwindi Impenetrable , Queen Elizabeth and Kibale Forest National Park , activities to see ‘the greats’ such as tracking the endangered mountain gorilla, a full day of chimpanzee habituation and forest walks to visit the countries old world monkey species. Of course you’ll also head to the savannah for some classic savannah game driving! This morning you will be tracking the illusive golden monkey. You will meet your guide early who will give you a briefing on the golden monkey tracking before hiking through a bamboo forest and former farmland, which is now, reclaimed national park land. If the weather is clear, you might glimpse a spectacular view over the Virunga volcano range on the horizon. You will spend an hour viewing the monkeys, watching these unique primates play and swing from the trees before returning to your camp for lunch. This afternoon you’ll journey along a winding murram road to reach the rainforest of Bwindi Impenetrable National Park. You’ll reach your accommodation before dusk so you can enjoy the views across the rainforest. You’ll then have a leisurely evening to prepare yourself for your gorilla tracking the next morning. Today is the day! You'll meet your Uganda Wildlife Authority guide bright and early to give you an orientation on tracking the gorillas and who will be guiding you through the impenetrable forest. The guides will be able to identify and explain the local plants, birds and wildlife as well the general ecosystem of Bwindi Impenetrable Forest. The length of the trek to find the gorillas can vary depending on where they have spent the night and can range from thirty minutes to six hours. Once you find these incredible creatures you will spend one hour with the family. This is for the gorilla’s protection as they can contract many of the same simple infections such as the common cold that we carry, but can prove very problematic for them, as they have no natural immunity. You’ll then make the return trek to your lodge where you’ll spend the rest of the day relaxing with views over the rainforest. Today you’ll have a slightly later start to the day. You’ll be heading out of the impenetrable forest to the Ishasha plains in the south of Queen Elizabeth National Park. These plains are particularly known for its iconic population of tree-climbing lions. You’ll meet a Uganda Wildlife Authority guide to maximise your chances of finding them relaxing in the cool shade away from the heat of the day. 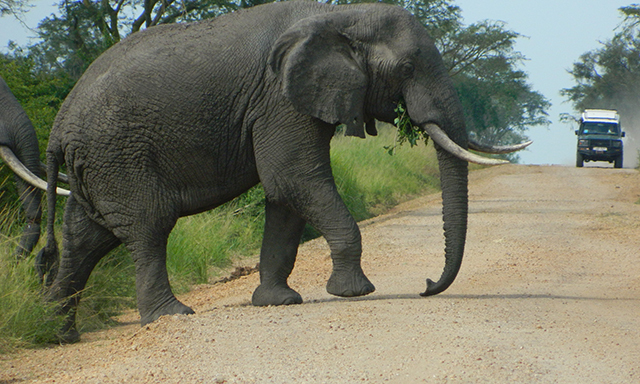 You’ll have a good chance of spotting a variety of game herds such as Uganda kob, buffalo and topi as well elephants. In the late afternoon you’ll leave Ishasha Plains and drive north alongside Maramagambo Forest to reach your lodge on the banks of the Kazinga Channel in the heart of Queen Elizabeth National Park. Don’t be surprised if you hear the lions roaring or some visitors wander into camp in the night! Don’t worry you’re perfectly safe! In morning you’ll enter Kyambura Gorge. The gorge contains its own rainforest ecosystem where you’ll be tracking the local population of chimpanzees. Your knowledgeable Uganda Wildlife Authority guide will firstly give you a briefing on the activity and some background information on the chimps you’ll be visiting. They He will then guide you down the decent into the gorge to take you along the forest paths to find these noisy and illusive creatures as well as be able to identify other notable species such a variety of monkeys, birdlife and fauna. You’ll be able to spend one hour with the chimps before to climb out of the gorge onto the savannah plains. This afternoon follow the Rwenzori Mountain range north passing through Ndali - Kasenda crater-lake fields. You will then continue on to your accommodation on the edge of the forest of Kibale National Park where you’ll be able to relax for the evening. Spend a full day with mans closest living relative in Kibale Forest National Park. You’ll need to beat the chimps out of bed to get there in time to watch them descend from their night time nests between 6am and 6:30am. Watch their natural behavior in the wild as they feed, hunt, nurse their young, relax, patrol and display their prowess. Before watching them weave their nests before they fall asleep at around 7pm. When you meet your experienced guides before the tracking begins you’ll be given an orientation on the chimpanzees and be accompanied at all times. We’ll also make sure that you have a packed lunch with you to keep your energy up. After the tracking you’ll be taken back to your accommodation so you to watch the sunset as you’re served up a hearty meal.